Edmonton is one of only two Canadian cities participating in a critically important North American program aimed at developing basic standards for an emerging applied technology called Connected Vehicle Technology (CVT). We will soon see small computer modules in every vehicle that will communicate with each other to make sure that one vehicle can’t follow another too closely, or avoid a collision with another vehicle altogether. If an accident or construction slows traffic, the system will immediately ‘see’ the slowdown in the data being sent from vehicles. It will send a signal to the driver’s dashboard video screen, showing them a detour, guiding them with GPS and adjusting traffic lights along the detour route to speed them along. Among a limitless number of possible uses, CVT can determine if a vehicle will run a red signal and can hold the conflicting traffic back so that serious, right-angle high-speed collisions can be avoided. Installed in buses, the system could make sure an express bus gets green lights all along its route. The City's Technical Specialist in advanced traffic analysis, along with partners in the private sector and in other cities, are currently testing equipment necessary for all this two-way communication to occur. The goal in this first (three-year) project phase is to develop and test common standards so that when CVT is installed in all vehicles, they can easily communicate with our transportation infrastructure and share information about the same things, using the same ‘language’. Learn about Edmonton’s Smart Bus Project and other ways that Edmonton is using technology and data to improve the ways people move in our city. 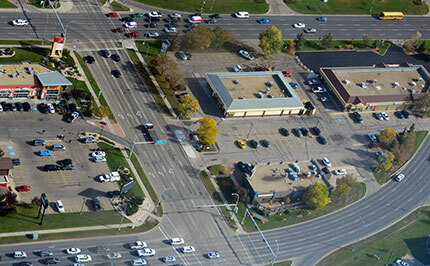 Read more about Connected Vehicle Technology research happening in Edmonton.